The city of Caen is one of the major objectives of the British armies engaged in Normandy. 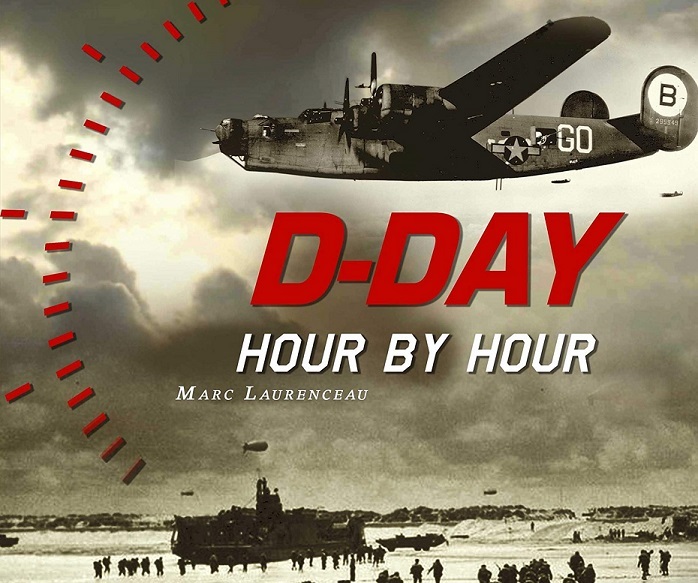 Hard fights began on the evening of June 6 for the conquest of this city, which was to fall into the hands of the Allies on D-Day, in accordance with the plans originally foreseen. 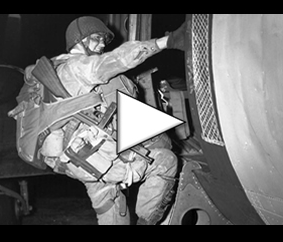 General Montgomery concentrated his efforts and decided to set up several operations in order to seize Caen, notably Operation Perch (June 7, 1944), Operation Epsom (June 26, 1944) and Operation Windsor July 1944). All of these operations have the unavowed objective of definitively piercing the front and causing the defenses to fall rapidly around Caen. But at the beginning of July 1944, a month after the landing, the city is still in the hands of the Germans and the latter accumulate their reinforcements in this sector. Montgomery makes the following observation: the bypass maneuvers have failed one after another, there remains only the option of the frontal attack. He wanted to establish a bridgehead in the northern part of Caen by seizing the various civil engineering structures in the area and progressing as far as possible towards the south of the city. The mission was entrusted to the 1st corps commanded by General Crocker, at the head of 115,000 men. 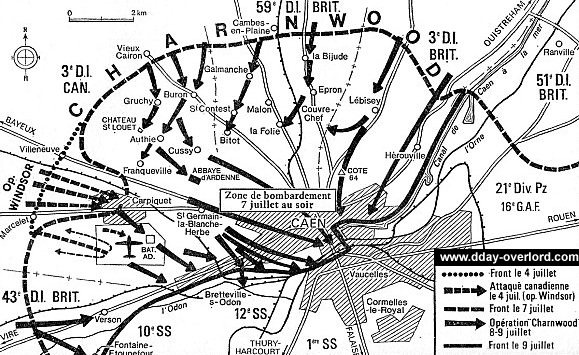 In order to prevent possible German reinforcements, the 8th corps receives the mission of fixing its opponents to the west of Caen in the next twenty-four hours. The British 3rd Infantry Division, supported by the 33rd Armored Brigade, was to attack northeast; The 59th Infantry Division Staffordshire, supported by the 27th Armored Brigade, attacked to the north; Finally, the 3rd Canadian Infantry Division, supported by the 2nd Canadian Armored Brigade, attacked to the northwest. The instructions given to General Crocker are to spread out his device to engage a maximum of adverse elements, hindering his possibilities of reinforcement and the consistency of his reactions. On the German side, the city is defended by the 12th SS Panzer Division, commanded by Kurt “Panzer” Meyer (composed of the 1st, 25th and 26th SS Panzergrenadier regiments), the 16th Luftwaffe Division (Luftwaffe-Feld-Division) of the 12th SS Panzer regiment. The command of these forces is then located at the Abbey-aux-Dames in the center of Caen (previously it was at the Abbey of Ardenne). The 1st S.S. Panzer division is located the south of Caen. Operation Charnwood is preceded by one of the largest aerial bombardments of the battle of Normandy: 467 Royal Air Force bombers (Lancaster and Halifax) carrying a total of 2,000 tons of bombs, 656 artillery pieces from five different divisions and four warships (HMS Roberts, HMS Belfast, HMS Emerald and HMS Rodney) are devoted to supporting the ground troops, not to mention reinforcements from the US Air Force and from Commonwealth bombers. This imposing firepower aims to shatter the German defense north of Caen, which has valued its positions for a month, and also to disorganize the units stationed south of Caen in reserve. At the end of the evening of July 7, 1944, the waves of bombers (which at that time represent half of the means of the Allied air bombing forces) succeed one another over Caen and drop their mortal cargo. Starting at 10:50 pm, six Mosquito bomber squadrons attack targets. At 11 pm, the 656 artillery guns reinforced by the warships opened fire on German positions and villages north of Caen. While most of the targets are missed and German lines of defense are virtually unaffected, massive bombing has a particularly positive effect on the morale of Anglo-Canadian troops. All night long, the bombardments continued. The few Anglo-Canadian soldiers who managed to find the sun are awakened shortly after midnight and then move on their line to unclog. The troops on the ground advance from 4:30 am, the artillery barrage simultaneously retreating towards the German positions. The return of the day allows the air forces to attack specific targets again and at seven in the morning, 196 B-25 Marauder head for Caen. But the clouds are low and mask the terrain: only 87 aircraft are able to drop their bombs. The British 3rd Infantry Division is progressing at a good pace, reaching Lebisey and then Herouville. The 59th Infantry Division Staffordshire is faced with a fierce resistance of the SS of the 12th Panzer Regiment at the center of the Anglo-Canadian system, on the approach and in the localities of Galmanche and La Bijude (where a company of the 176th brigade of ” Infantry loses all its senior officers during a neutralization shot of German artillery). At noon, Saint-Contest was reached by the 197th brigade. To the west, the 9th brigade of the 3rd Canadian infantry division fired furious fighting in Buron, in the hands of 200 soldiers of the 12th SS Panzer Regiment: it lost sixty per cent of its troops by seizing this Locality, around noon. As for the SS, they lose thirteen tanks south of Buron. Gruchy and then Authie were liberated by the 7th Canadian infantry brigade, while the 59th Staffordshire seized Saint-Contest and the Ardenne Abbey shortly before midnight. The German generals understood the Anglo-Canadian strategy and decided to employ the great means themselves: they ordered the 21st Panzer Division to redeploy to the northeast of Caen. But the Allied advanced observers see the movement and prevent any enemy movement by guiding a powerful barrage of naval artillery: the 21st Panzerdivision finally stays on the spot. Eighty percent of the city is destroyed following various bombings and ruins hinder vehicle movements. In the evening, order is given to the 12th S.S. to break contact and to retreat south of Caen. The Commonwealth Command is aware of this decline, but the abundance of German patrols north of the city deceives advanced units which do not exploit the situation. At nightfall, the two camps bury themselves, while the artillery pieces continually open fire on one side as well as the other. For Anglo-Canadians, the liberation of Caen has never been so close. The next day at dawn, on July 9, 1944, the first Allied combat patrols progressed in the ruins of the northern part of Caen. The Carpiquet aerodrome finally fell into the hands of Canadian soldiers, and by the end of the morning, Anglo-Canadian forces all gained access to the northern sectors of the Norman capital. Hard fights were committed to the conquest of the few bridges still standing above the Orne River. The Anglo-Canadian troops were also handicapped by the ruins of Caen, which prevented any movement or revival of the offensive. Operation Charnwood ended in a city cut in half and almost completely destroyed. But the Allies are not yet sure of holding the bridgehead they installed in Caen. They still have to seize Hill 112, a particularly important high point west of the city, which dominates much of the region. On July 10, 1944, the British launched operation Jupiter to that purpose, which they were unable to do. Nevertheless, they drive the Germans out and transform this movement of ground into a “no man’s land” raked by the bombs and which does not benefit either one or the other. The Anglo-Canadians thus made a cover in front of one of the characteristic points of the terrain and from which the Germans could have launched a counter-attack to drive the Allies from the northern part of Caen. On the same day, the French flag was hoisted in the city of Caen, even though demining and clearing operations continued. On 13 July, in Saint Martin’s Square, a military ceremony took place in the presence of the Allied soldiers, the Resistance fighters and the population of Caen, who suffered greatly from the fighting. From then on, the Germans reorganized their defenses south of Caen, in the region of Bourguébus. All reserves were deployed by Rommel in the Anglo-Canadian sector, freeing the Americans from this threat. General Omar Bradley took advantage of this to accelerate the plans for the breakthrough (operation Cobra). The reorganization of the German defenses to the south of Caen corresponds to the Allied strategic intentions which wish to gain access to the open plains of the south of the city in order to fight faster over larger areas. Moreover, the German losses are considerable and the commitment of all the reserves marks the end for the units of the replacements on the front line. From now on, the Germans have to fight almost without stopping, which is not the case with the Allied troops. The bombardment of Caen, which is one of the most important in the battle of Normandy, had particularly terrible consequences for the population of the city. Estimates of losses amounted to nearly 400 civilians killed. This is without counting the hundreds of injured and the indirect deaths related to the diseases declared after the bombings. Still, the survivors welcomed Anglo-Canadians as liberators. For the Normans, whose heroism is only too little emphasized, everything has to be rebuilt. Their freedom is at this price, that of blood. The Allies lost 3,817 troops during operation Charnwood, as well as nearly 80 tanks. The Germans, in a favorable position because in a situation of firm defense on land that they had time to value, lost more than 2,000 soldiers and 32 tanks. Caen is still not entirely in the hands of the Allies. Two new operations were needed to ensure that the Commonwealth forces seized the entire city: Goodwood and Atlantic, on July 18, 1944.